Registration is open for 2019!!! Ride 1,000 miles in 24 hours in the scenic Southwest. Join us in Kingman, Arizona on April 19, 2019 as we get ready for some great riding in the southwest. Riders Meeting on Friday evening 4/19 - We'll feed you and hand out your packet with your T-Shirt, and Rider Placard. Launch on Saturday morning 4/20 - We will send you on your way, two riders at a time. Ride - You will head to a series of 4 locations somewhere in the Southwest. You will take a digital photo that includes your placard, your bike, and the target. Arrive - Your goal is to arrive with all targets documented and the minimum required mileage on your odometer within 24 hours. If you properly complete all requirements, you will earn an IBA Saddle Sore certificate with the Kactus Kilo logo. We do all the route planning and all the paperwork! How can you beat that? If you are registered for the Tour of Honor, your certificate will include the Tour of Honor endorsement. Ride - You will head to a minimum of 2 bonus locations covering a minimum of 1,000 miles. If you properly complete all requirements, you will earn an IBA Saddle Sore certificate with the Kactus Kilo logo mailed to you (depending on the number of riders, the goal is within 2 weeks). 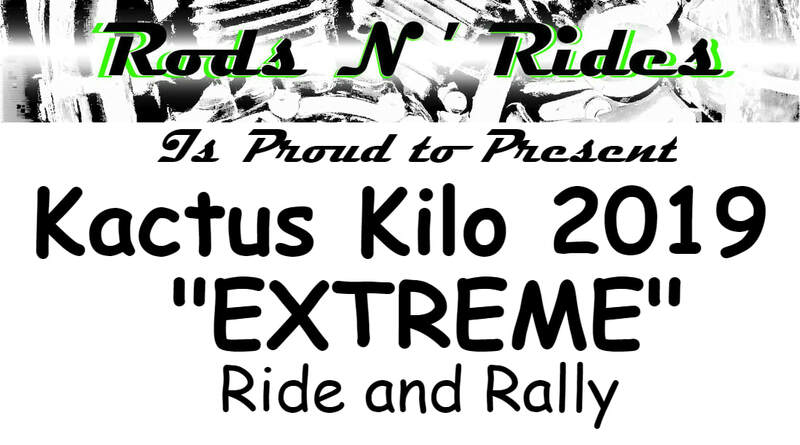 * Net proceeds from all Rods N' Rides events go to the Pediatric Brain Tumor Foundation through Ride for Kids events.